WASHINGTON — Alaska Sen. Lisa Murkowski finds herself in the middle of the fray once again, as President Donald Trump prepares to nominate his second Supreme Court justice for Senate confirmation in an appointment that will shape the court for decades to come. Murkowski is only one of 100 senators, but she holds the rare position of a moderate Republican, a vote the president needs to appoint his justice before the midterm elections in November. Murkowski is known for her support for abortion rights and gay marriage — positions usually out of step with Republican orthodoxy and what many conservatives want to see out of Trump's court pick. Supreme Court Justice Anthony Kennedy announced his retirement, effective July 31, at the close of the term this week. The president is expected to announce his nomination to replace Kennedy soon. Republican leaders hope to move through the confirmation process quickly and seat a new justice on the bench before the start of the October term, and before November elections could swing the composition of the Senate. A change in Senate rules means that only a simple majority vote is needed to confirm a justice. Currently, Republicans hold a 51-49 majority in the Senate. In a statement after Kennedy announced his retirement, Murkowski said her "standards for Supreme Court nominees are extremely high." She pledged careful scrutiny and "an independent vote." On Thursday, Trump brought Murkowski and five other senators to the White House to discuss the vacancy. The others included three Democrats who voted to confirm Trump's previous Supreme Court pick, Justice Neil Gorsuch, in 2017: Sens. Joe Manchin of West Virginia, Joe Donnelly of Indiana and Heidi Heitkamp of North Dakota. All three are up for reelection this year. Trump spent Wednesday night in North Dakota, rallying in favor of Heitkamp's challenger, and telling attendees that Heitkamp "will vote 'no' to any pick we make for the Supreme Court," according to an NBC News account of the event. The meeting also included Republican Sens. Chuck Grassley Iowa and Susan Collins of Maine. Collins and Murkowski are often paired in headlines: They are the Senate Republicans who routinely vote against abortion restrictions and defunding Planned Parenthood, and they both voted against the Republican efforts to repeal the Affordable Care Act last July. Murkowski told several news outlets Thursday that upholding Roe v. Wade — the 1973 decision legalizing abortion nationally — is at the forefront of her mind in her decision about a Supreme Court justice, but it's not the only factor in her decision. A spokeswoman for Murkowski did not respond to requests for comment Friday. Murkowski's judicial picks have not hinged on abortion rights issues in the past. Last year she voted in favor of Trump's Supreme Court pick Neil Gorsuch, a thoroughly conservative choice. And she voted against Obama's Supreme Court nominees, Justices Elena Kagan and Sonia Sotomayor. Until Trump makes a selection — and perhaps after — it is not certain that the nominee's feelings on overturning abortion precedent will be clear. It is typical for judicial nominees to avoid stating any outright preferences for specific rulings on possible future cases. Trump told Fox Business Network this week that he would probably not ask the question of potential nominees. Will Trump ask Supreme Court candidates if they will overturn Roe v. Wade? "Probably not" he told Fox Business Network. "They are all saying don’t do that, you don’t do that, you shouldn’t do that," he added. At a White House event Friday celebrating the tax bill passed in December, Trump appeared to take a small jab at Murkowski, and suggest that going against him could affect his support for her priorities (or not). Talking about the tax bill's provision opening part of the Arctic National Wildlife Refuge to drilling, he said: "I wasn't going to do it because I was angry at someone. I said I'm not going to do it." 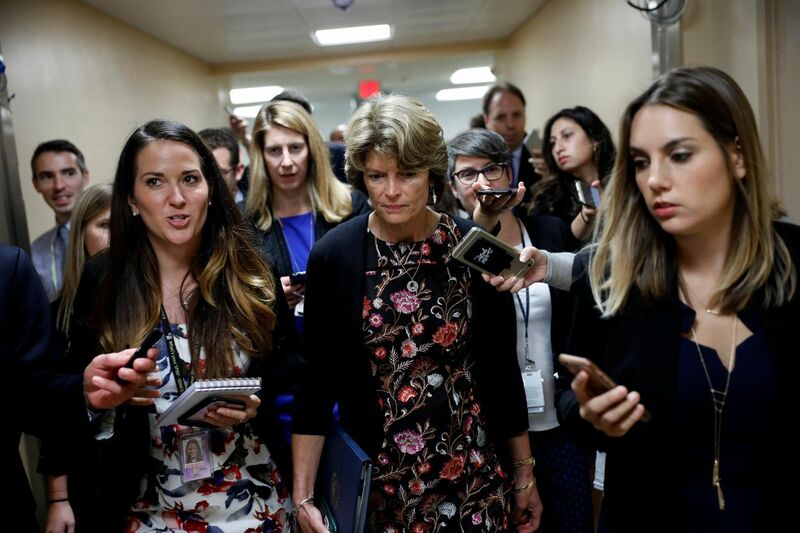 During a series of health care votes in July last year, Trump sent Interior Secretary Ryan Zinke to call Murkowski and Alaska Sen. Dan Sullivan and let them know that her "no" votes were putting Murkowski's Alaska priorities in jeopardy. That ultimately did not appear to be the case, and Murkowski was not swayed. Murkowski has appeared increasingly comfortable in recent months with her position as a Republican who often comes into conflict with the president and her party. That aligns with her willingness in recent years to counter her party on abortion issues. In 2012, Murkowski voted in favor of an amendment by Sen. Roy Blunt, R-Mo., that would allow health insurance providers to decide not to cover the cost of contraceptives based on religious objections. It was a decision that she ultimately told the Anchorage Daily News she regretted. "Well I think as most folks know right now access to safe and legal abortion is on the line with the retirement of Justice Kennedy," said Jessica Cler, Alaska public affairs manager for Planned Parenthood Votes. "We know that President Trump has vowed to appoint a justice that will overturn Roe v. Wade," Cler said. "Sen. Murkowski has stood with us before," she said, pointing to the senator's votes against overturning the Affordable Care Act. "We trust that she will" again. Cler said that her organization will be urging supporters to contact Murkowski to urge her to vote against a Trump nominee that might swing the court to the right. Asked about Murkowski's vote to confirm Gorsuch in 2017, Cler said she hopes that Murkowski will take a different approach, "given the stakes of what we're facing and the fact that we're facing the reality that the U.S. Supreme Court could overturn the constitutional right to abortion," she said. Pat Martin, the outreach and development director with the Alaska Right to Life Committee, took a similar approach but with a different view: His group would urge Murkowski to uphold her oath to defend the Constitution, he said. For him, that means confirming "a Supreme Court justice that upholds the unborn or children in the womb's right to life," he said. For that, "Sen. Murkowski has not been reliable," he said. "She generally sides with the abortion industry as opposed to the Constitution," Martin said.